So out of the models you listed only the R7 240 and R7 250 are officially supported. R7 240 GDDR5 as well as R7 250 GDDR5 should work just fine. in summary: R7 250 and R7 240 are the models that are supported for Dual Graphics with Kaveri. The AMD Kaveri APUs have officially been launched and we have summed up the details for the fourth generation processing units in this article. With the launch of these APUs, we have also obtained some new details regarding the dual graphics technology. AMD has been adding dual graphics support in their APUs since some time now, the technology allows a discrete graphics card to work in crossfire with the integrated graphics processing unit. AMD Kaveri APUs feature the R7 series Radeon graphics which from preliminary data suggested that AMD might allow all Radeon R7 series GPUs (discrete) to be compatible with the Kaveri APU but that’s not the case. The new information released show that AMD Kaveri APUs only feature Dual graphics compatibility with certain set of Radeon R7 graphics cards which feature DDR3 memory. 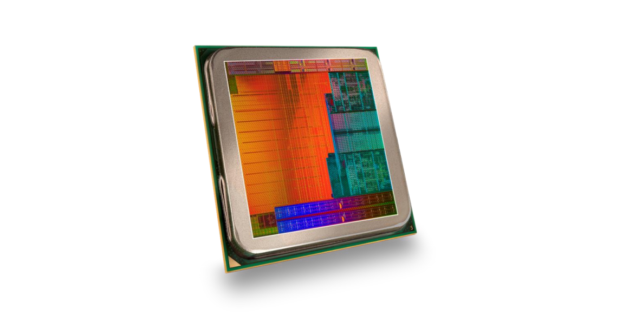 That’s right, the iGPU on Kaveri can only be couple with a DDR3 memory based R7 series partner. There are only two cards under the Radeon R7 series brand which are available in DDR3 flavors. These include the Radeon R7 240 and Radeon R7 250 which we had recently tested last month. Both cards are entry level models and aren’t actually suited towards gamers. The technical presentation AMD forwarded has some performance numbers of dual graphics in action with the A10-7850K and Radeon R7 240 (2 GB DDR3). 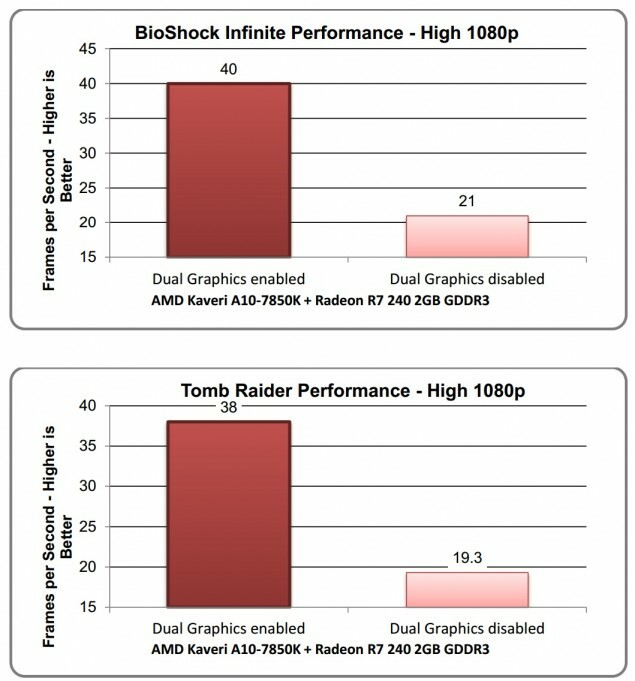 The performance results show that dual graphics does make the Kaveri APU run games at 1080P such as Bioshock Infinite and Tomb Raider which otherwise isn’t possible (atleast on high settings configuration) but that means users would have to spend $59 – $89 more on these graphics cards for a little performance upgrade and even that in a few titles since AMD CrossFire isn’t great on all gaming titles. The best choice for users would be to leave the Dual Graphics option and aim for atleast a discrete Radeon R7 260X or 270X graphics card to get far better gaming performance. AMD may add Crossfire optimizations to these games with the upcoming Catalyst 14.1 BETA driver but aside from that, atleast i think that investing in dual graphics is pointless unless you want to built a small form factor media PC or HTPC build.